The following sermon was preached on the first Sunday of Advent, 2015 (Nov 29), at the Church of St. Michael & St. George. Services began with the Great Litany; Advent Lessons and Carols will occur next Sunday evening. Collect: Almighty God, give us grace that we may cast away the works of darkness, and put upon us the armor of light, now in the time of this mortal life in which thy Son Jesus Christ came to visit us in great humility; that in the last day, when he shall come again in his glorious majesty to judge both the quick and the dead, we may rise to the life immortal; through him who liveth and reigneth with thee and the Holy Ghost, one God, now and for ever. Amen. Today is the first Sunday of Advent, and we mark the beginning of a new Church year: today is New Year’s Day for the Church. Our lectionaries shift to the next year in the cycle, and we begin to rehearse the great festal cycle of Jesus’ birth. We’re back at the beginning. But I’ve always found it a little ironic that we don’t seem to begin at the beginning. We don’t talk about creation on Sundays in Advent, we don’t hear about the flood, or the promises to Abraham. Instead we start with what looks like the end. In our Gospel today we hear Jesus again, continuing his theme from last week and the week before about the end of the world: the signs of the times, wars and rumors of wars, fear and foreboding, the powers of the heavens shaken. From ancient time, the tradition of the Church has been to use the season of Advent, the first season of the year, to address the Four Last Things. The Four Last Things: a classical grouping including Death, Judgement, Hell, and Heaven. Why do we do this? Why do we begin our year with the End? Our annual calendar cycle is not the only time we begin with the end. The Church has inherited from Judaism the tradition that the next day begins at sundown of the previous day. In that pattern, the first prayers of the new day are said as we all go to sleep. Evening Prayer, and Compline are the first prayers of the day, not the last. And as we go to bed we pray that we’ll be kept safe through the coming night, which is always interpreted as a figure of our own deaths. We go to sleep as we would go to the tomb: we do not know if we’ll wake up again. We begin the day in a figure of death, and we pray that we may come out of it again in the morning. The sunrise becomes like the dawn of a new creation and our own rise from sleep like our own resurrection from the dead. So every day in the church we begin with night, with death; and every year our first season of Advent begins with the Four Last Things, with Death, and the end of the world as we know it. Isn’t this counterintuitive? Backwards? Masochistic, even? Why do we do this to ourselves? Christmas is coming, why on earth should we talk about death? For two reasons. First, because it’s important not to kid ourselves about how well we’re doing. This year, that seems a little easier than other years. All you have to do is turn on the news to realize we don’t exactly live in Paradise, however we might want to describe it. Not just in our world either: in each of our hearts, in each of our lives, there are always traces of darkness, weaknesses, favorite temptations and sins, that we are loath to name, let alone give up. Any honest examination of ourselves reveals that we are not ready for Paradise, we wouldn’t know what to do with it, even if it showed up. Beginning the Church year with attention to death and darkness makes it clear just how great a Savior it is who is born in a manger: who comes to forgive the sins of the world, and allow us a fresh start. Second, and even more significantly, we begin the Church year with death, with night, and the Four Last Things, because creation doesn’t actually begin with a new world, fresh with the dew of Eden. Remember Genesis 1: in the beginning the earth was formless and void, and darkness was upon the face of the deep. Returning to darkness at the beginning of the year is a way of remembering that God made the world from nothing, including you and me, merely by speaking into the darkness. ‘Let there be light,’ and there was light. Even before the first Christmas, that Word of God, speaking into the darkness, is what all creation depends on for its continued life. From dust were we made, and to dust shall we return; except that this dust is animated by the breath of God, called into existence by his Word. In Advent we begin with death and consider our own mortality, the mortality of all living things, and the contingency of the created world. We are here to begin with by the Word of God. In Advent we meditate on this dependency, giving thanks for the grace to continue on living, even in the midst of our sinful, broken world. Meditating on this dependency, we see we have a deeper problem even than our sin: we are created from nothing, and but for the continuous grace of God, we would fly back into the nothing from which we were made, because that is the nature of created, contingent things. Sin, death, and mortality. A month from now, a Savior in a manger. Focusing on the Last Things allows us to see that this Savior does much more than merely forgive us our sins. The Baby in the manger is that Word of God, spoken into the void to create all things. At Christmas he comes robed in human flesh to knit God himself to his creation, ending mortality and death once and for ever. Even the grave will not be able to keep him, for he is life itself. In light of such a Savior as this, the Incarnate Word of God come to end the night of sin and death, we see that the Four Last Things — Death, Judgement, Hell, and Heaven — last in the order in which you and I experience this life, are not last after all. They are actually the beginning of all things. Death: the condition of our life in this world, ended by the Incarnation of the Son of God, and eternal life the new order of the Day. Judgement: on our sin and the sin of the world, rendered moot by the Savior who died in our stead, that Innocence might be the quality and currency of his kingdom. Hell: its power broken, its doors thrown down, and its prince bound by the Lord of Glory who stormed its bulwarks on Good Friday. Heaven: God and mortals reconciled, across the chasms of spirit and matter, life and death, the beginning of eternity under the reign of Christ. Advent, the Four Last Things, darkness, death, and the End. These are the places God speaks his Word, beginning his new work in each one of us and the world: speaking into the void, bringing all creation from nothing; born of the Virgin Mary on Christmas Day, to die for us and break the power of death; born into the heart of every Christian at their baptism, and strengthening them in the life of the Church. One day this Word of God will come again, to finish what he started. Time will end and eternity will begin: the end of the beginning, and the commencement of the rest of the story. What splendors await us there we cannot know now. But let us practice for it as we can, dying daily to sin, daily working to end the reign of death in our hearts. This Advent, this beginning of the Church year, let us keep in mind the Four Last Things: that when it comes our time to face them at our own death, we might be prepared to open our eyes and behold all of glorious eternity stretching out before us, with Christ our Maker, Christ our Savior, Christ our King. In the Name of the Father, and of the Son, and of the Holy Ghost: Amen. This sermon was preached on Sunday, November 15, 2015, at the Church of St. Michael & St. George. This Sunday was the first Sunday following the series of coordinated ISIS terrorist attacks in Paris which killed well over a hundred people. There was a baptism at the 9:15 service. Music included one of my favorite hymns, “All my hope on God is founded,” which was also sung at my ordination to the priesthood. Collect: Blessed Lord, who hast caused all holy Scriptures to be written for our learning: Grant that we may in such use hear them, read, Mark, learn, and inwardly digest them; that, by patience and comfort of thy holy Word, we may embrace and ever hold fast the blessed hope of everlasting life, which thou hast given us in our Savior Jesus Christ; who liveth and reigneth with thee and the Holy Spirit, one God, for ever and ever. Amen. Wars, rumors of wars, famines, earthquakes: the end of the world. Do you remember the supposed Mayan apocalypse from a few years ago? Or the apocalyptic preacher in Times Square a year after that? People were so taken in by these predictions of the world’s end that they quit their jobs, got married, got divorced, moved overseas, or racked up enormous credit card debt with crazy purchases. Who cares how much debt you’re in when the world is ending? Who cares how many people you hurt if you’re not going to be there to pick up the pieces when it’s over? There are plenty of cults — and whole religions too — which play off our fascination with the end of the world. And yet the one common denominator of our life here on earth is that the world seems to go on, time keeps on ticking, no matter the predictions of when it will end. On a darker note, there are also plenty of times when you and I might start to feel as if the world were ending, or at least when we realize that it cannot carry on this way much longer: events like this Friday’s coordinated terrorist attacks in Paris, or the breakdown of common life in our own country, or the establishment of vicious foreign societies like ISIS bent on the world’s destruction. If the world isn’t ending, it can sure feel like it at times; or at the very least like maybe it should. The truth is, that despite both the silly and the sad ways the end of the world presents itself in our culture, there is something in us — an instinct maybe — which is fascinated by the idea of The End. Of course you and I will never pay attention to a street preacher, we will never be hoodwinked by the books which predict an end in our time, we are much too sophisticated for that. But, somewhere far back in our minds, there is an instinct that suggests there might be something to it after all. Like children reading a story book, we are convinced there must be an end to the story: something that will make everything that’s happening make sense, something that will prove that good guys actually do finish first, and that evil doesn’t go unpunished. When we hear the radio commentator predict the end of the world — yet again! — we laugh. But something in us hopes it might be so, if only so that everything might finally be set to rights. Our Gospel reading this morning is one that is constantly used in predictions about the end of the world. There are people out there who make vast fortunes tracking famines and wars and earthquakes, selling books updating their fans on their latest assessment of creation’s progress towards the end times. Of course none of these authors quite realize that nowhere in this passage is the end of the world even in question. Jesus says nothing about the world’s end. He makes a very specific statement that the buildings of the temple will be thrown down, and in response to his disciples’ question, he offers some reflections on his own coming again. This isn’t the end of the world. Jesus answers them not with a date or a time, not with any suggestion of what to look for when he returns, but instead by saying, “Do not be alarmed,” Do not be afraid, “These things are but the beginning of the birth pangs.” Do not be afraid. These things are but the beginning of the birth pangs. With his answer, Jesus deflects attention away from the kind of ends we’re used to imagining: do not be afraid, these are the beginning of the birth pangs. It’s the end of the temple, the end of life as they knew it, but there’s really no threatening language here: no sense of any final annihilation, no suggestion of a final moment in which all of them must decide. The earth doesn’t open and swallow the wicked, fire doesn’t rain down from heaven, judgement is nowhere to be found. Rather the command, “Do not be afraid,” and birth pangs. Jesus reveals that the operative question here is not “When will we reach the end of the story?” but “What is God doing in the world, and when will it finally be ready to begin?” Think of the other times we hear “Do not be afraid” in Scripture: when Moses trembles before the burning bush, and receives the news that God will bring his people out of Egypt. When the archangel Gabriel visits Mary, and tells her that she will bear the Son of God. When Jesus at the last supper tells his disciples that he will be taken from them on the next day, as he goes to the cross to work their salvation. Do not be afraid. This command always heralds something new and wonderful that God is about to do in the world. Do not be afraid. These are only the beginning of the birth pangs. If we are stuck thinking about the end, we are asking the wrong question. God is actually not all that interested in endings to begin with. In fact his chief purpose is to put an end to all endings. We read in the Scriptures, the last enemy to be destroyed is death itself, and in Christ’s resurrection from the dead he breaks the grave’s stranglehold on life and opens the way for us to eternity. When he comes again it will be the final end to death, the final end to all endings, and the beginning of eternity with God. If our world is still rocked by wars and rumors of wars, earthquakes, famines, and violence, it is because death still struggles to have the last word. But we who are baptized are born anew, born by water and the Holy Spirit, into Our Lord’s deathless life. We do not have the luxury of sitting idle and waiting for the world to end, waiting for Christ to come back and fix it once and for all. We, the members of his body, are the vanguard of his kingdom. And it is our task not to wait for the end, but to be busy about the beginning: the beginning of the kingdom of God. We have work to do. We cannot buy into the culture of fear that assumes everything is a zero-sum game of win or lose, eat or be eaten, have or have not. It is tempting, because that culture can build great monuments, great temples to human industry that people admire and aspire to imitate. But there is a hidden cost to monuments to human achievement, there is a hidden cost to the pursuit of power and dominance, and that cost is always human blood. Instead our work, as members of Christ’s Body, is to cultivate love in the midst of ruin and failure and despair. Our work is to cultivate humility in a landscape planted thick with competing prides. Our work is to go, with our Lord, willingly to our deaths, even in the face of injustice and false accusation, so that innocence might shine all the brighter. Even though the stones of the temple fall, even though every monument be pulled down and all is devoted to destruction, He is there. And where He is, there the Resurrection holds sway, the forgiveness of sins, the raising up of what had fallen. Where Jesus is, there creation meets its appointed end: eternal life in the glory of God forever. In the Name of the Father, of the Son, and of the Holy Spirit: Amen. This sermon was preached on Sunday, October 25, 2015, at the Church of St. Michael and St. George. Collect: Almighty and everlasting God, give unto us the increase of faith, hope, and charity; and, that we may obtain that which thou dost promise, make us to love that which thou dost command; through Jesus Christ our Lord, who liveth and reigneth with thee and the Holy Spirit, one God, for ever and ever. Amen. Blind Bartimaeus. This is one of the shortest of many short miracle stories in Mark, and it’s often cited as a perfect example of Mark’s style: short, and to the point. But don’t be fooled. The brevity of Bartimaeus’ healing masks a much more profound meaning. Even a profound series of meanings. The early church fathers, along with monks, nuns, theologians, and all sorts of others, found a great deal to ponder here. For some, Bartimaues is a commentary on the Gentiles, and the way they come to faith. For others, Bartimaeus is a commentary on the people of Israel, and how they will come to know the Messiah. For still others, Jesus’ encounter with the blind beggar is an important step on the road to his passion and death. My own task this morning is to say something about stewardship, in the midst of all these meanings and more. But before we get there, I’ll take just a few minutes to observe how Bartimaues teaches us about prayer. First, Bartimaeus is blind. This is important, because it forces him to listen, to use his hearing as his chief sense. You and I may flatter ourselves that we can see better than Bartimaeus, but when it comes to prayer we are all just as blind, if not more so. If I had a nickel for every time someone said to me that they have a difficult time seeing the presence of God in their prayer life, I’m sure I’d be able to triple the parish endowment instantly. It’s hard to see the presence of God, especially when life has brought so many challenges this last year or two, both here in St. Louis and around the world. Some of you have known recent tragedies, others bear the scars of old wounds. Our experience and our memories both tend to obscure the presence of God, and we find it difficult to see his peace or his love at work. That’s where you and I can take a lesson from blind Bartimaeus. In those kinds of scenarios, our chief task is to listen: listen for the assurance of what we cannot see ourselves. Bartimaeus hears that Jesus is coming up the road, he has heard that this Jesus of Nazareth can heal the sick, that he has healed the blind. Bartimaeus hears the crowd shouting Hosanna. And even though he can’t see them, even though he is a beggar, destitute, he believes: that this Jesus is his Savior too. You and I, our first task in prayer is to listen like blind Bartimaeus. We cannot see as we would like. But if we listen to the crowd, if we listen to those who have witnessed what Jesus has done, we will know that despite our blindness, he can heal us too. Bartimaeus’ words, despite coming from the lips of someone you and I might consider deranged, are at the heart of all our praying. We cannot see as we ought, and our blindness prevents us from even the right kind of polite response to Jesus. You and I can do nothing but cry out with Bartimaeus, ‘Son of David, have mercy on me.’ Sometimes we embarrass ourselves with how silly we feel when we pray, and sometimes we are driven to it as if we can do nothing else. Sometimes it’s both at the same time. We don’t know what to say, but we say ‘Have mercy on me,’ and hope that God will respond with kindness. Lucky for Bartimaeus, and for us, Jesus does exactly that: hearing Bartimaeus calling wildly to him, Jesus stops and calls back, calls for Bartimaeus to be brought near. This is the third comment I’ll make about prayer: that Jesus always responds to our prayer by calling us closer to himself. No matter how wild our prayer, no matter how desperate our need, the first thing he does on hearing us is to call us to him. Bartimaues hears, and the people who had scolded him now help him answer Jesus, bringing him to the Lord. What about you and me? From where we sit, where does Jesus stand? And how might we respond to his call? With Bartimaeus we may stumble, we may need help to get to him. But when we pray, he always calls us closer to himself. However difficult it is to get there, when we respond to Jesus’ call to draw nearer to him, with Bartimaeus we find our eyes opened, and we notice all of a sudden that we are in the middle of the road. Bartimaeus, with his sight restored, does nothing else but follow Jesus. At this point in Mark’s Gospel Jesus is traveling the last leg of his journey, into Jerusalem for the last time, where he will be betrayed and crucified, and where he will rise from the dead. Bartimaues can see now, and the first thing he does is follow Jesus on the road to Calvary. This is my fourth and last comment on prayer: as we draw near to Jesus, responding to his call to us, we find our sight restored, we can see him; but he is on the road going beyond us even further, and we must follow. Having our sight restored, and our souls healed — like Bartimaeus’ eyes — is almost beside the point. His sight was restored and he followed Jesus. The same goes for us. However it is that God heals us, it is only so that we might follow all the more clearly, all the more intently, on Jesus’ road to Calvary. This is prayer: to listen for what we cannot see ourselves; to cry out with whatever abandon we can muster for God to have mercy on us too; to answer Jesus’ call closer to himself; and, our soul healed, to follow him to the cross and behold him resurrected in glory. This is prayer, to have our senses healed and our hearts brought to the knowledge and love of God. This is but one of the many things which Bartimaeus teaches us. So what about Stewardship? When Jesus calls Bartimaeus, the beggar throws off his cloak as he rushes to answer him. Bartimaeus did not have a penny in this world, he had only a cloak to keep him warm. And in the rush of responding to the Lord he drops even that to follow his Savior. You and I must do no less. We are just as blind as Bartimaeus, unable to see as we ought or as we’d like. What comforts do we cling to, and what must we drop in order to respond to Jesus? We often think of stewardship as being responsible with all the things that God has given us, careful and measured in every exchange, every transaction. And that’s true as far as it goes, Responsibility is a good thing. But until we are willing to give away our possessions with as reckless an abandon as Bartimaeus throws off his cloak; until we can call to God with as embarrassing an intensity as this blind beggar on the road from Jericho to Jerusalem; until we can follow Jesus to death and beyond, our prayer will always come up short of its goal. Let us call to Jesus with every fiber in us, let us give up everything which clings to us, and follow him to his passion and cross. So might we share with him in the glory of his resurrection; so might our vision rest always on the goodness of our God. In the Name of the Father, and of the Son, and of the Holy Spirit: Amen. A sermon on the feast of St. Mary Magdalene, in response to the shooting in Aurora on July 20, 2012, which I preached at St. John’s Cathedral in Denver, Colorado on the Sunday following that event. This was published soon afterwards in a paper which has proved short-lived, and can no longer be found there. Given last night’s events in Paris, it seemed timely to me to re-post it here, in a new format. Collect: Almighty God, whose blessed Son restored Mary Magdalene to health of body and mind, and called her to be a witness of his resurrection: Mercifully grant that by your grace we may be healed from all our infirmities and know you in the power of his unending life; who with you and the Holy Spirit lives and reigns, one God, now and for ever. Amen. “My tears have been my food day and night, while all day long they say to me,‘Where now is your God?’” In the Name of God, Father, Son, and Holy Spirit,Amen. Today we keep the feast of St. Mary Magdalene, and it’s fitting that we do. She is a figure of great extremes: completely overcome with joy to hear the words of grace spoken to her; or throwing herself at the feet of Jesus before he went to die, anointing him with her tears; or sitting in rapt attention listening to Jesus’ every word; or in the garden on Easter Sunday morning, so inconsolable in her grief that she does not recognize the risen Jesus, thinking him the gardener instead. In art she’s often depicted as unkempt, her long hair in tangles, arms outstretched, robes aflutter, absorbed utterly in the emotional demands of the moment. Many of us today are still reeling from the news of the shooting in Aurora late Thursday night, at a midnight showing of the new Batman film. I have spoken with some of you between then and now, and with many friends and colleagues around the church. Everywhere people are in shock. They are horrified. They are angry. They are deeply saddened. I for one have tried time and again to imagine myself in that theater. And yet I simply cannot. In my imagination I cannot get past the entrance of a masked man through an emergency exit, staring quietly at a packed house. That’s it. My imagination stops there. Ceases to work. Underlying all of this, of course, like a menacing, barely discernible pedal stop on an organ, there sounds the note of similar events in our past; most notably the Columbine shooting, which undid so many people across the country, and was so close to this community. For many of us, these events have the capacity to unleash a storm of emotional energy. For others, events such as these do not stir up passion but create anxiety in the conscience by the very lack of passion. For still others, they are left unable to speak at all, with no words to say. For all of us, these events occur on top of the whole world of feeling and memory which our spirits contain at any given point, emotions born of our own life’s experience: loneliness, heartbreak, despair; joy, peace, happiness; hardship, fruitfulness, stoicism; enduring memories of failure, success, and loss. Events like Friday’s shooting hit us amidst all these pressing realities, and our reactions vary accordingly. “My tears have been my food day and night, while all the day long they say to me,‘Where now is your God?’” It’s not often that preachers reflect on the Psalm in sermons; but today I think it’s singularly appropriate. It’s been the tradition in the Church, and in Israel long before the Church came to be, that the Psalms are the prayer book and hymnal of the whole people of God. The Psalms are full of every emotion and every situation conceivable under the sun. Today’s is one of the most celebrated and most beautiful of them all. “As the deer longs for the water-brooks, so longs my soul for you, O God.” “My tears have been my food day and night, while all day long they say to me,“Where now is your God?” All the extremes are present here. Every experience, every emotion. Indeed the Psalms often trouble us with the violent language some of them use, and with the intimate romantic language that others use. But in the context of Holy Scripture, these words are for us to make our own. In situations where we have no words to say, the Psalms give them to us. In situations where our emotions are too strong for any thoughtful consideration, the Psalms speak for us, channeling our experience into subject, verb, object; metaphor, symbol, analogy. The Psalms give us a language to speak when we cannot speak ourselves; and they give us words to say which otherwise we would not dare to speak. Why? Why be that vulnerable? Why bother to expose ourselves to God in such a clear, glaring way? Because in doing so we admit to ourselves our own humanity. And in expressing it to God, we take hold of that humanity, and are given grace to fulfill everything that we are: our thoughts, our emotions; our fears, our hopes. To rage in the words of the Psalms is to strip naked, and stand before God with nothing but ourselves and a plea for God to look at us; and in the looking to have mercy. In this way he clothes us with his love, and makes us whole. This is what prayer is all about, standing before God, hiding nothing, but offering our whole selves — cold, hot, clean, messy — to his loving care. So: 12 are dead in Aurora, 49 are wounded. We can be angry. We are allowed to be sad. We can be confused. Be stunned. Be silent. To do these things is to be human. And it is to embrace that fragility of our nature which is one of humanity’s chief beauties. To do this is to be like Mary Magdalene, who hid nothing from the God she loved. But in the throes of our emotions, let us not be fooled into being blinded to other things; let us not fall prey to self-centeredness and self-pity and self-righteousness. Instead, with Mary Magdalene, let the rage and roar of each of our human passions prompt us to look up and behold the Cross. The Cross:“tow’ring o’er the wrecks of time,” and “on which the Prince of Glory died,” as the old hymns have it. There, on the Cross, all our human emotions — and not our emotions only, but all the wickedness too: in your heart and in mine and in the man who shot into the crowd Thursday night — all our human emotions and all human wickedness hang together, in the body of one innocently condemned to death. And in that Body, all emotions, all wickedness, and all humanity are caught up and transfigured by God’s amazing grace. Where before there was strife and discord and violence, there is peace and unity and love. Because he who died a human on that cross is the same One who spoke into the void and created the cosmos, and whose love sustains the stars in their courses. He who died on that cross went into the grave and harrowed hell, that forgiveness might now rule over justice; peace over destruction; and love over hate. Let the events of this past Thursday night, and each of our emotions, prompt us to look up and behold that Cross, on which Life begins: life for all, together, in the communion of the saints: which spans every place, and every time, and every pain, and every joy; united by the one prayer of the one Spirit, flowing among each of us, through the Son, to the Father. The following sermon was preached at 8am, 9:15am, 11:15am, and 5:30pm on Sunday September 27, at CSMSG. This was “St. Michael’s Sunday,” the Sunday closest to the feast of St. Michael & All Angels, which we keep as our patronal feast. Music included the Bullock setting of “Christ, the fair glory” and Sidney Campbell’s “And there was war in heaven,” a setting of verses from Revelation 12. Collect: O everlasting God, who hast ordained and constituted the ministries of angels and men in a wonderful order: Mercifully grant that, as thy holy angels always serve and worship thee in heaven, so by thy appointment they may help and defend us on earth; through Jesus Christ our Lord, who liveth and reagents with thee and the Holy Spirit, one God, for ever and ever. Amen. How did St. Michael’s get its name? If you’ve heard the story, you know it’s almost an accident. John Tyler tells how it happened in his parish history: When the Skinker family gave land for a new church at the point between Ellenwood and Wydown, no one knew what to call it. Isabella, the Skinkers’ daughter, looked through the Prayer Book for a solution (she was a good Episcopalian! ): she noticed that every major feast of the church year had a corresponding parish in St. Louis, all except for St. Michael & All Angels. And so the church got its name. Who is St. Michael, and who are all the angels? In art, and poetry, and Scripture, we see the Angels surrounding the throne of God, moving back and forth between heaven and earth, ministers of God to his creation. We see the high drama of heavenly battle: Michael with his sword and shield casting the devil out of heaven: Satan, formerly chief of the angels, corrupted by pride, defeated by Michael, leader of the heavenly host. Milton attributes to Satan the battle cry, “Better to reign in hell, than serve in heaven.” And so he falls, to tempt the earth. But the devil does exist, and today he works the same evil he has always worked. Not by assaulting heaven, but quietly, personally: in the Garden of Eden, he tempts Eve with his own special temptation: disobey, eat the fruit, and you will be like God. Adam and Eve are already like God, they are made in his image. But they are tempted by mastery, authority, being peers with their creator. And so Paradise is Lost: in the moment of grasping at the temptation to be like God, Satan, and we ourselves, grab hold only of idolatry, corruption, and decay. In a world like ours, where Satan does not risk open assault but works quietly and individually, how does Michael keep him out of heaven? 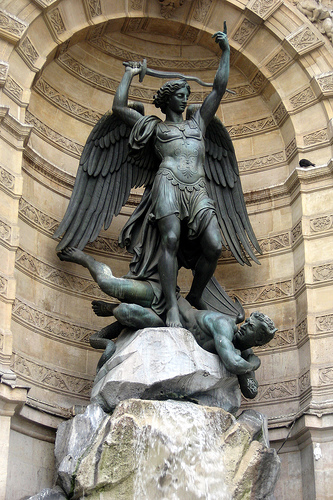 How does the archangel defeat his schemes? The same way he has always done. Michael’s name, literally translated, is a question: Micha-el, “Who is like God?” It is the exact inversion of the Serpent’s temptation, “You will be like God.” Michael asks, “Who is like God?” A rhetorical question, no one is like God except God himself. At its heart, this is worship: to render to God what is God’s, starting with his own nature. Michael’s humble worship, not claiming for himself what properly belongs to God, is what defeats the Devil. Our own humble worship is what keeps Satan at bay in our own lives. But there’s a great irony here: Michael’s name can also be translated, “He who is like God.” By his humble worship, Michael is granted what he could never have claimed for himself: a place to stand for ever in the very presence of God, enjoying his grace and love, being present in his counsels, and aiding in the execution of his will: truly, one who is like God. We pray that “as they always worship and serve [God] in heaven, so by [his] appointment they might help and defend us on earth.” This ministry of the angels is none other than Michael’s own ministry: rendering to God pure and spiritual worship, in all humility. When they come to help us, they do not abandon their reward in the splendor of God, but share it with us wherever on earth they find us, helping us to see the glory of the Hope to which we are called, and strengthening us to pursue it with every fiber we can muster. In this way, the angels do their part in knitting together the fellowship of heaven and earth. Are you sensing a theme yet? Since I’ve come to this church, I don’t know how many times I’ve heard someone say, one way or another, from one source or another, “It’s all about relationships.” I’m glad you all think so, because if nothing else, and there’s a lot else, our patrons, St. Michael and all the angels, get relationship with God right. Where does it start but in worship? Who is like God? That kind of worship always keeps Satan in check. Worship. It’s what we do here every Sunday, and throughout the week. It’s the best, clearest way we have of relating to God and to each other for that matter. Why do we stand and kneel, why do we bow to one another, why do we get all dressed up? Because in church we step, with Michael and all the angels into the heavenly court. And like any other stately court, we adopt manners and courtesy befitting the Lord we approach and the dignity of his servants who attend him. It’s all about relationship: a relationship Satan’s pride would fragment. In church we are all God’s servants, working towards the same end, rendering to God that which is God’s: Each of our lives, and all creation. It is an act of generosity, of thanks-giving, of sacrifice. More than this, the God we worship does not sit like an idle tyrant merely receiving the gifts his people offer. He has given himself to all and to each, even to death on a cross. What we offer God in worship is what He has already given each of us: Our lives and our world, but chief of all his own Son. At the altar, by the Holy Spirit, we join Christ’s own offering of himself to the Father, and we are received by God into Christ’s own Sonship. When we make our communions, we do not receive “a holy snack,” but we come with our fellow Christians to God’s table in heaven, where we join Michael, all the angels, the Blessed Virgin Mary, the holy martyr George, and all the redeemed from every age in one divine fellowship. Now we experience in part, then we will know in full: the unmediated splendor of God who fills all things with his love. “It’s all about relationships!” Isabella Skinker may have chosen our name in a process of “fill-in-the-blank,” but she could not have chosen better. St. Michael and all the Angels get their relationship with God right. By living it out in humble worship, they put Satan to flight, enjoy the nearer presence of God forever and get their relationship with us right too. With patrons like these, you and I are constantly reminded of the need to give our all to worshiping God: in all humility, to getting that relationship right, and relationships with our neighbors right too. “It’s all about relationships.” Satan still stands at our doors and in our ears, whispering to obey him and be like God. Let us resist his pride wherever it tempts us, aided by all the legions of heaven. His way leads not to God but only to fragmentation, isolation, and death. He wishes to reign in hell: let him reign over a silent, dead kingdom. You and I, let us rather serve in heaven, and do our part, with the angels, of knitting together heaven and earth in one communion and fellowship. So God shall be all in all forever. In the Name of God, Father, Son, and Holy Spirit: Amen. Collect: O God, whom saints and Angels delight to worship in heaven: be ever present with us your servants who seek through music to perfect the praises offered by your people on earth; and grant to us even now glimpses of your beauty, and make us worthy at length to behold it unveiled for evermore; through Jesus Christ our Lord. Amen. “Lord I believe, help my unbelief.” In the Name of God, Father, Son, and Holy Ghost, Amen. Sometimes, heaven can sound a little disappointing. If you’re like me, you might be worried that all those angels might not turn out to be the most fun company, and that all those clouds might be just a little bit too plain. Even singing praise to God, while a lot of fun, can also be exhausting — and maybe, if that’s all we’ll be doing, maybe it might be just the tiniest bit boring. Our theme for this year’s course is heaven, and you all have been singing beautiful psalms and hymns and spiritual songs about heaven. You’ve heard Canon Boston preach a sermon about the ways we can see heaven even now, at work among us. But all that notwithstanding, sometimes it really is hard to see just what all the fuss is about to begin with. The father in this evening’s Gospel is a good example of what I’m talking about. His son is in need of healing. It’s not a complicated need, and Jesus has performed lots of similar healings. The father has every reason to believe that when he brings his Son to Jesus, he will be healed. But Jesus is away when he arrives, so he asks the disciples for their help instead. They have performed similar healings too. This one shouldn’t be difficult. But for some unknown reason, they can’t heal this man’s son. Their failure causes an argument in the crowd, and this is when Jesus arrives on the scene. The father is sadly losing patience: his son is still sick, his hopes are disappointed, and on top of it all, he finds himself at the center of a very public scene. This is not what he wanted. The things you and I desire are usually much more, well, down to earth than the popular portrayals of heaven. We want to live in peace with family and loved ones. We want to be free from the limitations of bodily life, we want to be able to do what’s right. These are all things we try to accomplish even while we’re still here on earth. And it always feels pretty crummy when we can’t manage to do it. It’s important because by saying this, the father surrenders the outcome to Jesus. No longer is he asking for a service to be performed for his son. Now he makes a prayer, that he himself be brought to greater faith, greater trust, greater peace. It’s a remarkable surrender, and no longer insists on any outcome but the one Jesus is willing to give. Jesus responds by healing his son. The crowd marvels, and father and son go on their way together, restored. When you and I face disappointments and failed hopes, the Christian faith asks us to surrender them to Jesus. This is close to the heart of what prayer is all about to begin with: surrendering things, people, projects, goals, hopes, to Jesus; offering them to him, allowing him to do with them according to his own purpose. Only in this way do we get ourselves sufficiently out of the way to allow God to do his work in us. The Christian faith doesn’t ask us to surrender only disappointments to Jesus either, but every part of our selves: every desire, every hope, every good wish and noble goal. This allows Jesus to work in us and in the world. And it gets us near to him by the act of surrender. What does all this have to do with heaven, with clouds, and with Angels playing harps? If heaven is going to be more for us than merely a disappointing litany of unsatisfying images, we have to surrender it to Jesus too. Offer all our ideas, all our fondest hopes, all our nagging fears about the kingdom of heaven, to Jesus, to whom that kingdom belongs. “Lord, I believe, help my unbelief!” Once we make that surrender, our Lord will make haste to help us. He will welcome us into his kingdom, and help us to see how its contours spread over the whole earth and encompass the heights of heaven. When we surrender what we want out of heaven, our Lord is free to give us what it really is and means: not a reward for good behavior, but eternal life in his nearer presence for ever, with Angels, archangels, apostles, prophets, martyrs, and all the faithful departed; where the mysteries of grace continually unfold, and we are brought to the fullness of the stature of Christ himself, our master and our friend. In the Name of God, Father, Son, and Holy Ghost, Amen. The following sermon was preached at 8am, 10am, and 5:30pm on Sunday July 19, at St. Michael & St. George. Collect: Almighty God, the fountain of all wisdom, who knowest our necessities before we ask and our ignorance in asking: Have compassion, we beseech thee, upon our infirmities, and those things which for our unworthiness we dare not, and for our blindness we cannot ask, mercifully give us for the worthiness of thy Son Jesus Christ our Lord; who liveth and reigneth with thee and the Holy Spirit, one God, now and for ever. Amen. In seminary many of us knew about Jeremiah 23, and frankly we were all just a little bit terrified. Jeremiah is talking about priests and prophets, religious leaders who in his day had sold out to the idols of Egypt, Phoenicia, and Aram. They had set up images of those gods in the towns and villages, even in the temple itself; and they took the people’s offerings and made sacrifices to these other gods. Whatever was left they kept for themselves. Why did they do it? It’s hard to say for sure, but likely it was a combination of all sorts of things. Like all people at all times, they needed allies, and adopting foreign religious practices is an effective way to prove good faith to potential friends. The people themselves may have been enticed by the novelty of multiple deities, and no doubt there was a market for importing exotic religion into daily life. By Jeremiah’s day, many centuries had passed since Moses had led the people out of Egypt, and it was even a few hundred years after David and Solomon. It would have been easy to forget the urgency of those shepherds’ devotion to God, and the significance of a whole people devoted to his service. What did it matter if the priests sacrificed to Asherah, if the royal prophets counseled alliances at any cost, if fraud and deceit and corruption were the order of the day rather than accountability to the Law? However it all happened, Jeremiah holds the shepherds accountable. They are the ones to whom it had been given to look after the people, and keep them in the service and love of God. For anyone who is called “pastor,” or anyone else whose responsibilities include leading people, Jeremiah’s words today are very harsh. It’s a good thing the prophet offers an alternative, in one of the most famous and well-beloved images in the Bible. God says, “I myself will gather the remnant of my flock . . . and I will bring them back to their fold, and they shall be fruitful and multiply.” God declares himself his people’s shepherd. It’s fitting we also heard the 23rd Psalm this morning, “The Lord is my shepherd, I shall not want.” We love this image, of the Lord being our shepherd. For my part, it’s a welcome relief to consider that even pastors have a pastor, the same One who is shepherd to us all. It’s no surprise that Jesus makes extensive use of the same image to describe his own ministry, and the Gospel writers continually make the same point. In our Gospel today, Jesus looks with compassion on the crowd because they are “like sheep without a shepherd.” And even though he was on his way to escape the crowd for a bit, he tends to their needs instead. The theme of Jesus the Good Shepherd was so beloved by the early church that it was among the first things they painted in the Catacombs, an inspiring image even while they faced persecution. But what does it mean for all of us to be under the care of the Good Shepherd? It’s not always as bucolic as it might seem. First of all it means our lives are fundamentally nomadic. No matter how much we might be at home in a particular pasture, we will always need to leave it before too long. Shepherds move their sheep constantly, in order to bring the flock to fresh pasture, and also in order not to overgraze the land. On this earth you and I are always guests and sojourners, being led by our Shepherd finally to our true and lasting home in heaven. Heaven always stretches before us. And even when we depart this life for that one, we will continue in our pilgrimage, never stopping but traveling further into the mysteries of the grace of God. Even our church services imitate this constant movement: along this long nave here at St. Michael and St. George, every week we start at the back and move forwards, towards the altar, finally receiving a foretaste of the heavenly banquet before returning to our lives in the world. Second of all, following the Good Shepherd on our nomadic track means recognizing we do so with lots of other sheep. Sheep get a bad rap because they often blindly follow one another, which can get them into trouble. But another way to look at it is to see that sheep trust each other implicitly, and rely on each other to get where they need to go. When one makes an error, many others are affected — not because they are stupid (though why might be!) — but because they would rather be led into error than break the bonds of fellowship and trust which unite the flock. If you and I are to be reliable guides for our fellow members in the flock of God, we must do everything in our power always to be listening for the voice of the Shepherd. Only when the whole flock listens for his voice with one accord will we be led in safety to the place where we are going. In other words, we have a responsibility to one another to listen carefully to Jesus’ voice, and to do everything in our power to remain within earshot. Come to the Daily Office and the weekday Eucharist; attend each other’s events, participate in our outreach ministries. Look after one another, and pray together. The whole church is strengthened by each individual’s devotion, and the integrity of the whole Body is built up by each member acting in concert with one another, under the Shepherd’s direction. Finally, the third point I want to highlight about living under a common Shepherd: the metaphor is about sheep and their Shepherd, but it doesn’t stop there. Our Good Shepherd is not only a shepherd, but is also the perfect Lamb of God. What does that mean? He is himself the final sacrifice which takes away the sin of the world. And while he comes from the courts of heaven to all the dustbins of earth, to your heart and mine, he does not come as a condescending lord, but as a brother, a lamb among sheep, to make us members of his own household for ever. There are very few things in religion more wonderful than considering the Good Shepherd, how he calls to each of us and how we might respond to his voice. But it is a risky life! There is no final security in homes or possessions, but a nomadic journey from earth to heaven. There is no striking out on our own paths, but accountability to the rest of our Shepherd’s flock, and a responsibility to be reliable guides for one another as we listen to his voice. We follow him not to fulfill our own designs but to be forgiven where we have gone astray from his designs, and to share his kingdom, his power, his glory, forever. Let us be careful, then, of trying to be our own shepherds. Let us pay attention to the voice of Him who is the Good Shepherd of us all. In the Name of God, Father, Son, and Holy Spirit, Amen. The following sermon was preached at 8am, 10am, and 5:30pm at the Church of St. Michael and St. George, in St. Louis, Missouri. This was my first Sunday back from Maine, and was also the day after July 4. St. Louis’ Independence Day celebrations this year were held very close to church in Forest Park, owing to construction near the Gateway Arch. Collect: O God, who hast taught us to keep all thy commandments by loving thee and our neighbor: Grant us the grace of thy Holy Spirit, that we may be devoted to thee with our whole heart, and united to one another with pure affection; through Jesus Christ our Lord, who liveth and reigneth with thee and the Holy Spirit, one God, now and for ever. Amen. In the Name of the Father, and of the Son, and of the Holy Ghost, Amen. One of the characteristics of the Christian religion is something that’s often called, “The scandal of particularity.” Maybe you’ve heard the phrase before. Essentially, it means that our religion is fundamentally tied to the particular: not lost in abstract concepts, but deeply concerned with material things, and their spiritual import. In our Bibles, God reveals himself to particular people at particular times, using a particular language and specific human beings. Why is this a scandal? Because many people are troubled by the task of having to translate through time and space. Others are troubled by the implication that God’s truth has not always been universally accessible. Still others think it’s unfair that certain people and nations throughout history have been considered special enough to receive God’s word. The scandal of particularity is a real scandal, and it’s worth spending time wrestling with it. There are lots of positive implications too, though. Even if you or I don’t feel especially spiritual on any given day, we can still approach God through the spoken words of our common prayer; through our conscious decision to love our neighbors; even through the contemplation of creation, and all God’s many wonderful works. Best of all, it means we can rely on the fact that God is really, actually interested in the hum-drum of our daily lives: because that’s the way he has chosen to reveal himself, through the small, unimportant actions of everyday individuals in everyday places. First with Adam and Eve, and Noah. Then with Abraham and David and the whole people of Israel. Then with Jesus’ incarnation, the apostles, and the whole church around the world. Christianity begins with the particular, with each individual listening to God and obeying his voice in the nitty gritty of their own daily lives. And because it begins with the particular, our task as Christians is to love and obey God in the particular too. One of the great principles of Christian theological ethics is set forward by St. John, the beloved disciple: we cannot claim to love God whom we cannot see, unless we first love our brother whom we can see. We begin with our families, our neighborhoods, and then our cities, our states and nation. This is Independence Day weekend, and it is a good and Christian act to celebrate our country, and to give thanks for all the good things God has given us. The realm of the particular is not always easy, though, and that’s why I suspect some people prefer their religion to be abstract, full of noble principles but divorced from day-to-day living. It’s not always easy to love your family, or your country. But in those moments we struggle to do it anyway, and that’s where we learn things like discipline, and long-suffering, and the need to ask for forgiveness. The scandal of particularity, and the difficulty of loving one’s particular setting, are both in the background of today’s Gospel lesson. Jesus has preached and cured the sick all around the Sea of Galilee, but now he returns to his home town, to Nazareth. He preaches in the synagogue there. His home congregation is less impressed than they are envious, and they are offended by him. In St. Luke’s telling of the same story, they are so enraged at him that they drive him to the edge of the ridge on which Nazareth is built, and try to cast him over the side. But Jesus escapes and goes on his way. Here is the scandal of particularity in microcosm. Jesus himself is the incarnate Son of God: the second person of the Trinity, in human flesh, come to a specific people at a specific time and place. His healing miracles and his teaching, even in the particular setting of his hometown, are rejected. Later, he will be rejected by his home nation, as its chief priests and officials conspire to have him executed. On the face of it, it looks like failure, and the end. But in today’s Gospel, fresh from defeat in Nazareth, Jesus sends out the disciples two by two, to do the same miracles that he was doing, in the same manner, with the same sermon. It’s almost as if Jesus’ rejection makes him double down on his whole project, and renew his efforts. Why? Why is Jesus so unbothered by rejection and failure? Especially when the whole mission seems to be to these people, at this time? Partly because it was his mission to die for their sakes and ours, and not to convince them of any idea or policy. But also because, while Christianity begins with the particular, it does not stop there. It carries on, through the particular and earthly, to the heavenly and eternal. Jesus preaches and heals in his own time and place, in first century Galilee and Judea. But he also inaugurates a kingdom which transcends it. All of us who are baptized into his death and resurrection are citizens of that kingdom, even while remain citizens of our own nation. As citizens of the kingdom of God, we are one people with persons of every language, tribe, and nation. We rejoice together in the victory of our God not over foreign states, but over sin and darkness, disease and death. We long for that kingdom’s final consummation, when God will wipe away every tear from every eye, and all shall be at rest in the perfect freedom of his service. In the meantime, we are all dual citizens: of our own country, and of heaven. If sometimes we experience a little strain at the tension between them, well it’s no wonder. One belongs to the here and now, on an earthly timeline, with an earthly trajectory, and earthly agendas. The other belongs to the eternal glory of God, on a spiritual timeline, with a heavenly trajectory. What we are now is not yet what we shall become in the grace of God. But where we are now is where God meets us, and begins to draw us, with all our various duties of love to family and nation, into his kingdom. In a few moments, we will come to the holy communion, to the Lord’s supper. In this Sacrament, earth and heaven meet: the scandal of particularity, and everything nitty and gritty about our lives; our families, our neighbors, even things as common as bread and wine. These are taken up in the prayer of the whole church and transformed by God into instruments of grace, emissaries of his heavenly kingdom to the here and now of our lives. Every time we make our communions heaven and earth are brought a little closer together, and the glory of God shines all the brighter in our lives, wherever it is we are. What am I trying to say? First that, on this July 4th weekend, we should give thanks to God for our nation and for each of our communities, knowing that it is in the particular moments and duties of our daily lives that we know the love of God. Second, that God makes his love known to us in this way in order that we might be made citizens of his heavenly kingdom, even while we remain citizens of our earthly nations. And finally, that in God’s economy he has given us gifts of grace whereby heaven and earth are knit together, and we enjoy even now a foretaste of heavenly glory. May this taste strengthen us to do the work we are given to do, and become the people we are created to be, now on earth, as it is in heaven. The following sermon was preached at 8am and 10am on Sunday June 28, 2015, at All Saints by-the-Sea, in Southport, Maine. Collect: O Almighty God, who hast built thy Church upon the foundation of the apostles and prophets, Jesus Christ himself being the chief cornerstone: Grant us so to be joined together in unity of spirit by their doctrine, that we may be made an holy temple acceptable unto thee; through Jesus Christ our Lord, who liveth and reigneth with thee and the Holy Spirit, one God, for ever and ever. Amen. Some of you may have heard, at some point or other, that there’s a peculiar feature to the Gospel of Mark. It occurs many times throughout the course of the Gospel, and we’ve got it again today. Scholars call it, very dramatically, the “Messianic Secret.” The way it usually goes is that Jesus performs a miracle, and then promptly orders people not to tell anyone. Sometimes they listen and sometimes not. But it’s a curious phenomenon. Why is Jesus so secretive? Either he’s a master of reverse psychology as a marketing device, or he wants people to know who he is by some other means than his miracles alone. As far as today’s Gospel goes, he’s kept the secret well enough that the major characters don’t quite seem to know who it is they’re dealing with. Jairus comes to Jesus and falls at his feet asking for his services. This is a posture reminiscent of the prophets, especially Elijah and Elisha, both of whom performed many healing miracles. The woman with the hemorrhages must think of Jesus as some kind of wizard: she treats him like a sorcerer, full of innate power, and she says to herself that if she can only touch him, then she’ll be healed. Neither one is what Jesus is really about. Mark states at the beginning of the Gospel that his whole point as an author is to show that Jesus is the Son of God. Prophet and sorcerer are interesting variations, but they don’t quite get it right. From my perspective here this morning, the really interesting thing to me is that Jesus doesn’t really seem to care what these people think of him. He heals the woman of her hemorrhages, and he raises Jairus’ daughter, even though they don’t quite get who he really is. What am I getting at? That Jesus is who he is regardless of what we know or don’t know about him. He is who he is regardless of what you or I think about him. Our opinion will not change him one way or another, cannot turn him into something more or less palatable as we desire. In this day and age we can easily get caught in the trap of thinking about Jesus as if he were any other subject for public comment or opinion. We can easily get caught up in behaving as if he were simply another brand we buy or another candidate for whom we cast a vote. We can manipulate Jesus’ legacy, we can profit from his name. We can get distracted into thinking it’s our opinion of who Jesus is that matters. But nothing we do or think or say can change him one way or the other. Jairus and the woman in today’s Gospel learn this in a profound way. Jesus responds to their needs, but what he doesn’t do is play by the rules they set down. Jesus goes to Jairus’ house, and raises his daughter from the dead. But unlike the prophets who had accomplished similar healings, he merely takes her by the hand, and says quietly, “Little girl, get up,” and she rises from what had been her deathbed. No complicated gestures, no long process, no back and forth with his disciples or with servants or with Jairus, unlike prophets like Elijah and Elisha. Only a word, and she gets up from her bed. Likewise with the woman: she touches him and she is healed. But she gets more than she bargained for: Jesus stops, the crowd goes still, and he wants to identify the person he has just healed. This is no anonymous trip to a witch doctor: this woman is called out in public. She is understandably afraid, but Jesus isn’t angry. He calls her “Daughter” (even though it’s likely that she is much older than him) and tells her that her faith has made her well. Not the power of his robe, or any kind of magic, but faith. In today’s Gospel, Jesus refuses the labels and expectations and opinions of even the people he heals. He is not Jairus’ prophet, he has no time for complicated intercessions or ceremonies of court. He is not the woman’s sorcerer, he is not interested in anonymous displays of power. Instead, by his manner in both of these scenarios, Jesus insists on relating directly with each of the people he heals, speaking to them in friendly, familiar terms, even giving his hand to help the little girl to get up. He is not bothered by the wrong ideas people have of him, but neither does he play by the rules they set up. He is playing his own game, working to fulfill his own mission. And whatever Jairus, or his daughter, or the woman with the hemorrhages thought of him — no matter what you or I might think of him — He is going to do it his way and in his time. What do we learn from these episodes, about who Jesus is and what his mission is? For starters, the woman with the hemorrhages grasps furtively for Jesus in the midst of the crowd much as Eve might have grasped for the fruit in the midst of the Garden. But this woman is not after forbidden fruit, rather the wholeness she has spent 12 years seeking. Jesus calls her Daughter, and reverses the Garden’s drama from estrangement and mortality to restoration and healing. The servants laugh at Jesus for saying the little girl is only sleeping. But this comment foreshadows what he is about to accomplish by his own resurrection from the dead: transforming death itself from a shadowy abyss into the gate of Paradise. Yes, Jesus is who he is no matter what we might think of him, no matter how we might treat him. He will accomplish his purposes regardless of whatever distractions we create or sins we commit. You and I might be better served if we stop trying so hard to figure out what Jesus is really about, what he means for each of us or for the world — and instead ask ourselves who are we to Jesus? How do we fit into his plan, and what is his purpose for us? If we search the Scriptures we will see that at every turn Jesus is less interested in people being right about who he is, and more interested in treating them as objects of love, the people he came to forgive and to restore. All I have to offer by way of conclusion or commission is to suggest that you and I spend some time this week practicing. Offer to Jesus your heart, your whole self, just as it is. He made you, and he knows where you are most in need of healing and forgiveness. Let him do with you what he came to do, let him show you the way “out of error into truth, out of sin into righteousness, out of death into life.” You might be surprised. Your opinion of who he is might change. Or it might not. But if you let him be who he is, figuring out the “Messianic Secret” will no longer matter, and you will find yourself forgiven, healed, loved without condition or reserve, a member of the household of God. The following sermon was preached at 8am and 10am on Sunday June 21, 2015, at All Saints by-the-Sea, in Southport, Maine. This is a summer chapel, and I was there for two weeks serving as supply while enjoying some vacation time on the coast. Collect: O Lord, we beseech thee, make us to have a perpetual fear and love of thy holy Name, for thou never failest to help and govern those whom thou hast set upon the sure foundation of thy loving-kindness; through Jesus Christ our Lord, who liveth and reigneth with thee and the Holy Spirit, one God, for ever and ever. Amen. Good morning again, it really is wonderful to be with you. I was saying to Aims yesterday: I’m just in the process of moving, from Providence Rhode Island to St. Louis Missouri, where I’ve just started in a new post. It’s a wonderful place and I’m very glad to be there, but moving is such a chaotic process: to decide you’re going in the first place, and then to say your goodbyes, not to mention packing everything in boxes and entrusting someone to load it on a truck and drive it across country — and then to unpack and get settled in a new place. It always takes longer than it seems, and even though I’ve moved a few dozen times in my life, it is always an experience of great displacement. If you’ve moved recently you’ll know what I mean; and even if you haven’t, displacement is something that seems to going around. The news is full of one scandal after another, and election season is already bringing promises of “change for the better,” of one sort or another. Wars around the world and economic troubles have made the globe a less recognizable place than it once was. Even in church, we are inundated with statistics and forecasts describing how religious life is changing in this country and predicting how it will change further before it’s all over. In a climate like this it’s very easy to feel areal sense of displacement. We know where we came from, and while we’re not there anymore, it’s hard to say where exactly it is we are. And it’s even more difficult to say where it is we’re going. As with all moments of uncertainty, there is a vague threat of danger: what if we don’t like the result? What if I regret the move? What if the displacement becomes so severe that all sense of home gets lost? Today’s Gospel presents an extreme case of exactly this scenario. The disciples are mostly fishermen. They grew up near the Sea of Galilee, they are used to the water, they’ve been in and around boats their whole lives. Jesus has finished teaching — he’s been in a boat teaching from the sea to allow more room for people on the beach — and it’s time to cross to the other side of the water for tomorrow’s work. Now the Sea of Galilee is not large: about 8 miles wide at its widest point, and 13 miles long. At all points on its surface, you can see the other side. Your port of origin is visible for the whole journey to your port of destination, which has also been visible the whole time. The point is, the Sea of Galilee is not a threatening body of water, especially for experienced fishermen. It’s even fresh water, not salty! And yet a storm arose there which seemed to shake the disciples to their core. Conditions were suddenly, unpredictably extreme: a strong wind, waves beating against the boat, and water swamping over the sides. Why were the disciples unable to cope? We don’t know. Maybe the boat was smaller than they were used to. Maybe with twelve people plus Jesus they were too heavy for the conditions. Maybe they were just taken by surprise. In any case, it’s an understatement to say that they were no longer at home in that boat in that storm. Everything familiar about the sea had gone, and their own expertise was no more use. In its place was a violent, raging tempest that threatened to destroy them. And what about Jesus? Jesus was not a fisherman. He grew up in Nazareth, a town in Galilee, but a full day’s walk from the sea. He was a carpenter’s son, and now he worked as a rabbi. There was no reason he should have been comfortable in a boat to begin with, let alone in a raging storm. But where was he? In the back, asleep on a cushion. The disciples were panicking, fearing for their lives. But Jesus, their landlubber teacher, was so comfortable, so at home in this storm, that he was fast asleep. I think the disciples were as surprised at this as you and I, and their surprise probably added to their panic as well as to the note of anger in their question to him when they wake him up: “Teacher, do you not care that we are perishing?” I don’t think they say this because they want him to do something. What use would a carpenter-turned-rabbi be on a ship in a storm anyway? They simply cannot understand why he is so calm, why he is so at home. We know the rest of the story. Jesus rebukes the wind, and tells the sea to be still. Calm returns, and they all get on with their voyage. The point I’m trying to emphasize here though is not that Jesus calmed the storm, but that he was so at home in the middle of it to begin with. Jesus is at home in storms. It sounds counterintuitive for the prince of peace to be so comfortable in stormy weather. But Jesus’ peace, unlike our own so much of the time, is not dependent on outside conditions. Jesus’ peace results rather from who he is: the Son of God, by whom all things were made, and for whom all things exist. Too often we think of our stormy lives as threats to peace, threats to whatever fragile serenity we’ve managed to acquire for ourselves. But today’s Gospel shows us that nothing on earth can threaten God’s peace in Jesus, who is at home even in a terrible storm. And Jesus’ whole desire is to share his own peace with each of us. When we are in trouble, or confused, or “all at sea” with the changes and chances of life, all we have to do is bring our trouble to Jesus. “Teacher do you not care that we are perishing?” He might stand up and calm the storm for us, or he might call us out of the boat to walk across the waves to where he is walking by. But in any case he will certainly grant us his own peace, and call us closer to where he is,at home and perfectly at rest in whatever storms arise. In this way, our own personal storms and difficulties are transformed: from occasions of fear and dread to moments of grace, and special signs of God’s presence and care for us. One of the ways St. Paul talks about being a Christian is by saying that Christians live “in Jesus” or “in Christ.” To live in Christ is to have our permanent home exactly where Jesus is. He is at home everywhere: not just in peace and happiness, but in storms and troubles too; for three days he made his home even in death. By his resurrection and ascension He made his home in heaven, and by his gift of the Holy Spirit He makes his home now in your heart and in mine. To be in Christ is for his peace to be our own. It is for us to know that deep down we really are at home in him, no matter how terrible the storms outside. Whatever troubles may assail us, let us bring our cares to him. He will not disappoint: our anchor will hold “within the veil,” where he dwells eternally in heaven, and our hearts will find peace there forever. In the name of the Father, and of the Son, and of the Holy Spirit, Amen.